"The mangosteen has only one fault; it is impossible to eat enough of it, but, strictly speaking, perhaps that is a defect in the eater rather than in the fruit." I got my first glimpse of mangosteen stacked up in baskets at several markets in Bali, Indonesia, but didn't get around to trying them for awhile. I'd heard they were good and had read about their grand history in a number of fruit books, but I was just too busy devouring jackfruit, salak, and interesting banana varieties to get around to them. Yesterday I was out for a bike ride around the hills surrounding Ubud, though, and found an old woman at a stand by the side of the road with a stack of them on hand. I decided I'd buy a few for my post-exercise meal, and man am I glad I did. The mangosteen is about the size of a trangerine with a leathery dark purple shell that you pop open to expose moist, fragrant white bulbs of ambrosia-like flesh. I could explain that the taste is bit like litchis with some peaches thrown in for good measure, but the fact is that the combination of flavors mingled together in a single mouthful is indescribable. It needs to be eaten to be understood. All you need to know about the flavor is that you must go and taste it now. Although now available throughout much of southeast Asia, Indonesia and its neighbor, Malaysia, are where the fruit originated, and perhaps the best places to eat it. Horticulturists James Herbert Veitch visited Java in 1892 specifically to eat them, and he said that, "It is necessary to eat the Mangosteen grown within three or four degrees of latitude of the equator to realize at all the attractive and curious properties of this fruit (1)." Today it's easier and cheaper than ever to travel to a place where you can get fresh mangosteens (the fruit doesn't travel well, and isn't at its best when imported), but getting a taste of it hasn't always been as easy as hoping on a plane. The fruit inspired a host of explorers to go in search of it and attempt to bring it to other regions. Did you know mangosteen trees have their biggest fruit yields around their 45th year, but continue to bear fruit past their 100th birthday? The earliest (unsuccessful) English attempt to spread it throughout their empire occurred in 1787, but it wasn't successfully transplanted to England and fruited until 1855. It was spread to regions of the empire but had limited success outside of tropical Asia. There's a legend that in the days before quick plane travel and refridgerated freighters, Queen Victoria offered either a knighthood or 100 pounds sterling to anyone who could deliver to her a fresh mangosteen, a significant challenge because of how quickly they spoil. The story seems to have originated in the writings of fruit explorer David Fairchild (2), though, and there's not a lot of evidence to back it up. Because of its amazing taste and scarcity, the fruit has developed a real following over the years, and is sought out by fruit hunters and favored by tropical travelers. It's unknown where the queen name came from, but it may be a reference to the fruit's name in a native tongue. 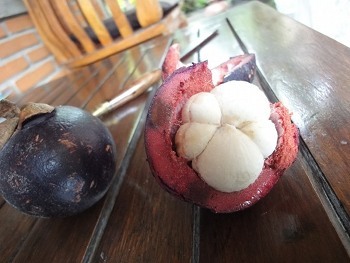 Durian is called the king of fruits, and I think mangosteen is a fair match for it. Within the last decade the US has allowed small-scale importations of the fruit, but only if they have been irradiated, a process that would discourage most health-concious people from going near them. A few of the plants have also been established in Costa Rica, with similar small-scale imporations going on. As of today, the best place to get them is still in the tropics. Learn how the mangosteen fits into a healthy raw food diet. Read about other awesome tropical fruits here. (1) Veitch, James Herbert (2006). Hortus Veitchii. Caradoc Doy. p. 89. ISBN 0-9553515-0-2.